Tony Stark built his first suit of armor in a cave, out of salvaged missile parts. He has since upgraded his armor numerous times, using his scientific genius and personal fortune to create the most advanced piece of technology on the planet. The MK7 model is the one he uses as a member of the Avengers. Yeah, so we can't get a Mark VII armor in the 6" scale, but Art Asylum comes through and delivers a Minimate of it. The most substantial, notice-it-at-a-glance difference between this armor and all the other red and gold ones is the inclusion of big bars that run over the shoulders. Yeah, that's it. The boots, gloves, belt, and "shoulder pad" style armor are all new as well, and the thighs and biceps are unique molds, as well. It's just that none of those are immediately evident. 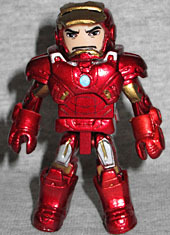 The figure has the usual two helmets, a yellow exhaust flight stand, and replacement hair for his Tony Stark face. No shawarma, sadly. When a scientific experiment went wrong, scientist Bruce Banner was dosed with gamma radiation, triggering an uncontrollable transformation whenever he became stressed or angry. After years on the run from the U.S. military, Banner was tracked down and recruited to the Avengers Initiative. 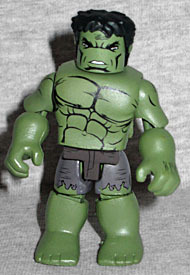 Hulk gets a lot of extra pieces to make him look big and bulky: a chest cape, bicep covers, large hand/forearms, a big waist cap, thigh pieces, and massive feet/shins. All his details are painted on, which is mostly fine: the only problem is that the tampo for his chest was applied pretty severely askew, so it's nearly sliding off the body. Whoops! Joss Whedon understands that Hulk's story isn't an entirely heroic one, but rather about the way people choose to handle their anger: so when Banner changes accidentally, Hulk is vicious and brutal; when Banner chooses to change, that's the calmer, more useful Hulk. To that end, we get two heads: one reserved, and one furiously angry. 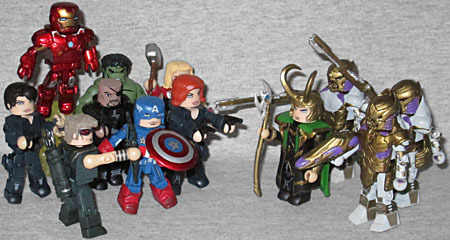 I didn't plan to buy Marvel Minimates Series 45 (other than Maria Hill): I already had plenty of Caps, Thors, Iron Men and Hulks, you know? But a really good deal at Luke's Toy Store changed my mind, and it turned out this entire series was really neat.